Next in importance to the divine profusion of water, light, and air, those three great physical facts which render existence possible, may be reckoned the universal beneficence of grass. Grass is the forgiveness of nature-her constant benediction...Forests decay, harvests perish, flowers vanish, but grass is immortal. It yields no fruit in earth or air, and yet should its harvest fail for a single year, famine would depopulate the earth. Grass softens the rude outline of the world. Its tenacious fibers hold the earth in its place. It invades the solitude of deserts, climbs the inaccessible slopes and forbidding pinnacles of mountains, modifies climates, and determines the history, character, and destiny of nations. Some have speculated that without grass man would be just a beast of burden, the great conquests of Attila, Genghis Khan, or Caesar would never have occurred, and wars would be constant tribal feuding to avoid starvation. Forages are plants or parts of plants eaten by livestock and wildlife and the variety of plants that are eaten is amazing. It is helpful, therefore, to classify those plants into groupings. 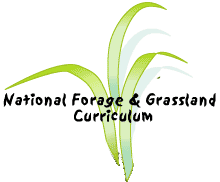 The major group of forages are grasses (75%), but there are also legumes, forbs, shrubs, brassicas, and some trees. Ten of the fifteen crops that keep mankind from starvation are grasses. There are around 10,000 species, though about 1400 are seen in the United States, covering almost half of the nation. Only orchids and daisies have more species that grasses. There are grasses for almost every temperature and precipitation range. Only lichens and algae extend to wider climate zones. Because of the wide range of adaptation for many grasses, they are often introduced into new areas. Many of the common grasses used today for forage in the U.S. are not native, and scientists throughout the world work to breed grasses to thrive in varying places. Learning to manage imported or new species is a part of current grassland management. Grasses are often taken for granted but actually are the most important plant group. Grasses belong to the Poaceae family which is also known as Gramineae. Grasses are usually herbaceous which indicate that they produce a seed, do not develop woody tissue, and die down at the end of a growing season. They are monocotyledonous which means one leaf sprouts from the seed, and often have jointed, slender, sheathed leaves. A cotyledon is the first leaf to emerge from a seed. Legumes are dicotyledons, meaning two leaves emerge from the soil surface. Grasses can be large, like bamboo or corn, or small like annual bluegrass. Grass plants develop fruit called grain which feed much of the world and yet have green leaves and stems not digestible for humans that are the main food source for animals. Grasses can also be used for building materials, medicines, and biomass fuels.